Huge, Vintage Antonio Prieto Studio Pottery Vase Description and Item Information Up for sale is this studio art pottery vase by the listed California artist, Antonio Prieto. Please excuse the glare in the photos. 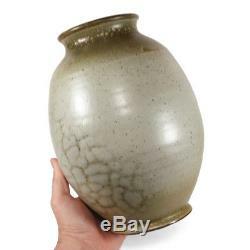 This large, hand thrown pot stands approximately 10 5/8 inches tall; it has a maximum width of about 7 5/8 inches. Unpacked, it weighs 6 pounds 14.1 ounces. 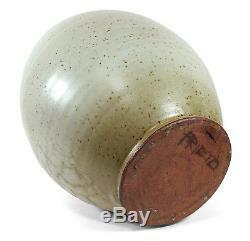 It has a semi-matte, greenish gray glaze with darker green highlights. This would be a fine addition to a collection of American studio ceramics. He attended the California College of Arts and Crafts (CCAC), the California School of Fine Arts (CSFA), and Alfred University. He was husband to Eunice Prieto. He taught at the CCAC and at Mills College, where he was an influence to many now famous studio potters. He exhibited widely during his lifetime, and his work is now held by important museums and in private collections. Condition The vase looks very good overall, with light wear. It has a very minor "clamshell" or incomplete chip to the base (see Photo 5). This is difficult to see, and does not detract overall. There is no other damage. There is crazing to the interior bottom. 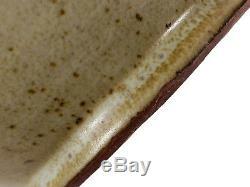 The glaze has a curdled texture to one side, as made and as shown. Variations in glaze application are as made. Payments must be received within three days of the end of the listing, unless prior arrangements have been made. Some countries have restrictions or prohibitions on certain classes of merchandise. And international government regulations prohibit such behavior. Individual computers may display colors differently. 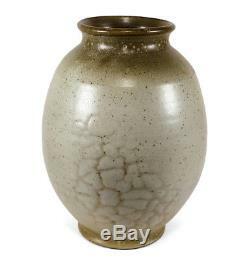 The item "MOD VINTAGE ANTONIO TONY PRIETO HAND THROWN CALIFORNIA STUDIO ART POTTERY VASE" is in sale since Wednesday, February 14, 2018.